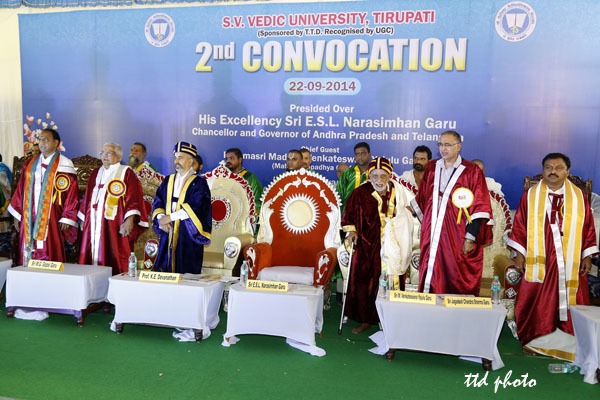 Tirupati, 22 September 2014: The Hon’ble Governor of Andhra Pradesh, Sri ESL Narasimhan advocated that the students of vedic studies should become the custodians of entire humanity through the spreading of the vast knowledge embedded in the sacred literature of Vedas. 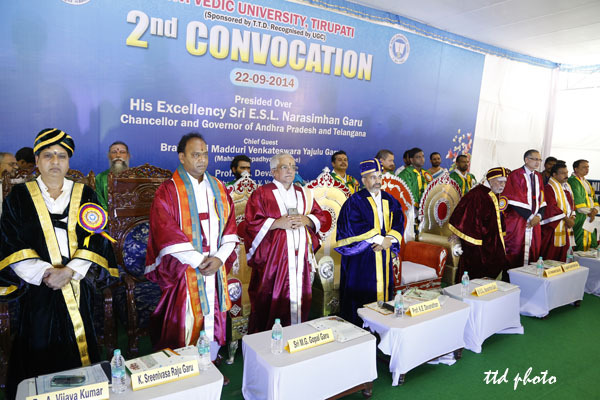 The 2nd Convocation ceremony of TTD-run Sri Venkateswara Vedic Varsity took place in the varsity premises in Tirupati on Monday. 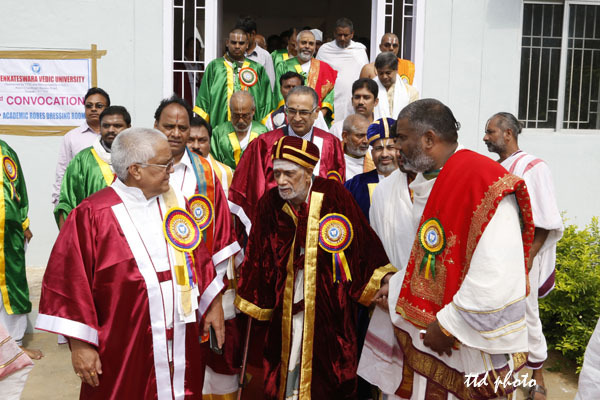 In his absentia, the Hon’ble Governor of Andhra Pradesh and Chancellor of the Varsity sent his message on this auspicious occasion. 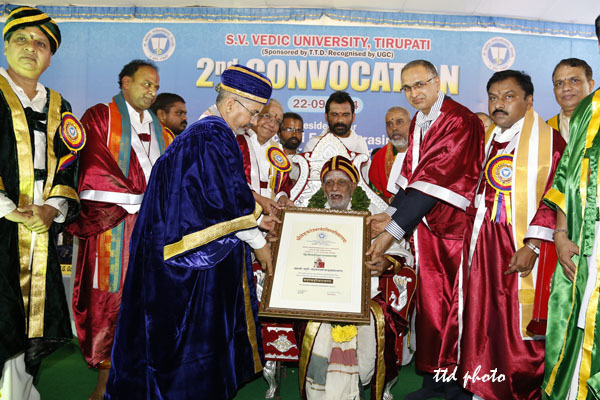 The Vice-Chancellor of the varsity Sri KE Devanathan presented the message of Hon’ble Governor Sri ESL Narasimhan – who described the vedic graduates as (Quote) “The Protectors of Dharma”. 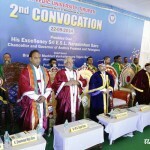 The message advocated that the students should not confine themselves with mere studying or acquiring a degree in vedic knowledge but should take up the propagation of the great human values taught by the ancient sacred text for the betterment of the society. 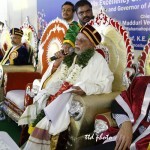 “Vedic scholars are not just spiritual seekers but they should be the seekers of the welfare of the world too. 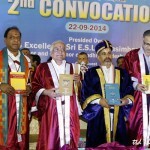 Many scientific ideas which emerged today are evident in vedic texts. For instance the Pythagoras Theorem was discerned from Sulabha Sutra which is a part of Kalpsutra of Yagna karma. This clearly shows that Vedic Knowledge is far superior to Modern Science. 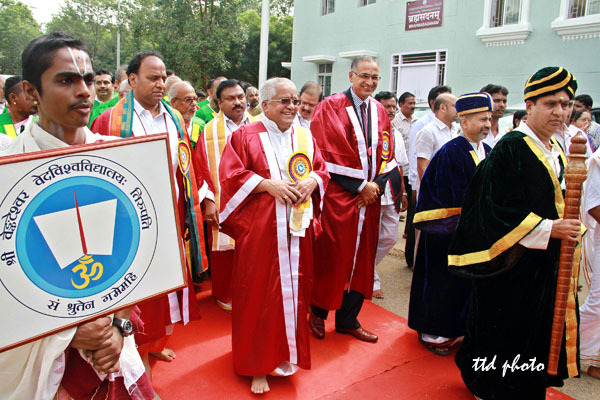 So the students of this esteemed university which is situated right at the Lotus Feet of Lord Venkateswara should take up a new and novel path to achieve the goal of establishing a humane world by propagating the quintessence of vedic dharma. 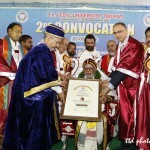 The Governor in his message also congratulated the 414 graduates of Vedic varsity who were awarded PhDs, and Degrees and also congratulated the varsity for conferring Honoris Causa-“Mahamahopadhyaya” to the eminent vedic scholar Brahmasri Madduri Venkateswarayajulu on the auspicious occasion(Unquote). 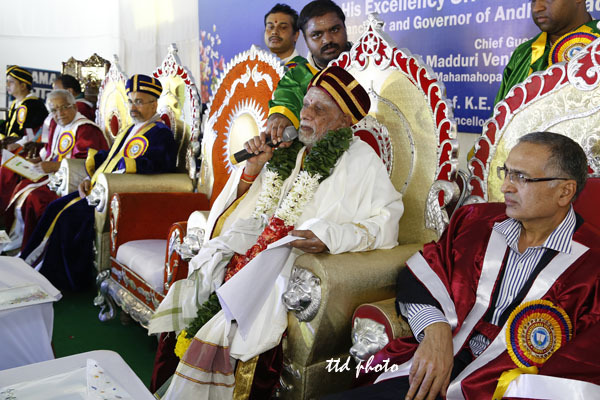 After the conferment of the title “Mahamahopadhyaya”, Brahmasri Madduri Vekateswarayajulu who graced the function as Chief Guest in his address called upon the vedic students to strictly practice veda karma apart from studying veda vignana. 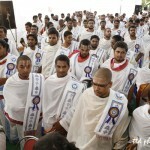 “Vedas are nothing but the sacred words uttered by our deities. They taught the way to lead a righteous way of life. Mere acquiring textual knowledge is not sufficient. You should practice them by performing yagnic karma, rituals as per shastras. 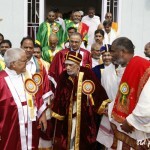 Then only you could be called the “Guardians of the society”, he added. Earlier the Varsity VC briefed on the the motto and objectives of the varsity. 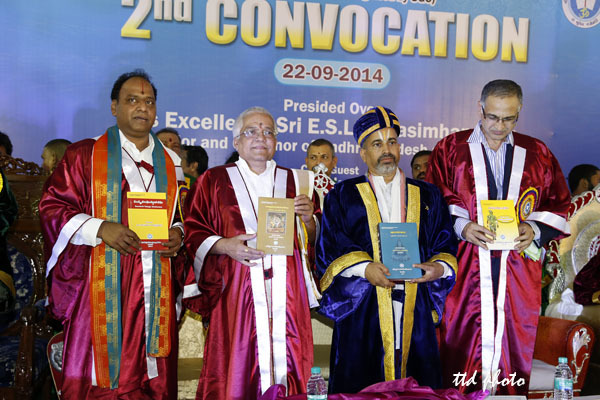 Later the Specifed Authority Chariman of TTD Sri J C Sharma, EO Sri MG Gopal released twelve books including Karanagama, Samskrita Laghu Sambodhakosah etc. 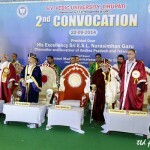 JEOs Sri KS Sreenivasa Raju, Sri P Bhaskar, Devasthanams Educational Officer and Registrar of Varsity Sri Vijay Kumar, HDPP Secretary Sri Raghunath, Rastriya Sanskrita Vidya Peeth VC Sri Harekrishna Satapathy were also present. 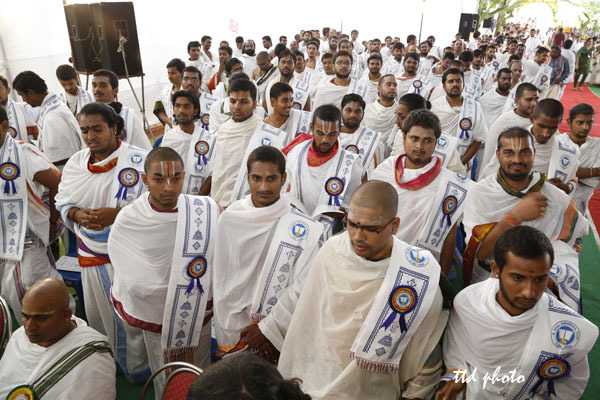 TTD EO Sri MG Gopal on Monday asserted that the temple administration of Tirumala Tirupati Devasthanams (TTDs) is bound to propagate, promote and preserve the vedic knowledge by taking up intensive vedic programmes at regular intervals. 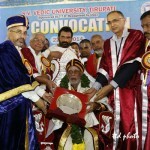 He said to promote vedas locally also TTD has recently organised month long Vedic conferences in the name “Veda Sandesam” to disseminate the knowledge present in vedas in Tirupati under the aegis of SV Vedic university. 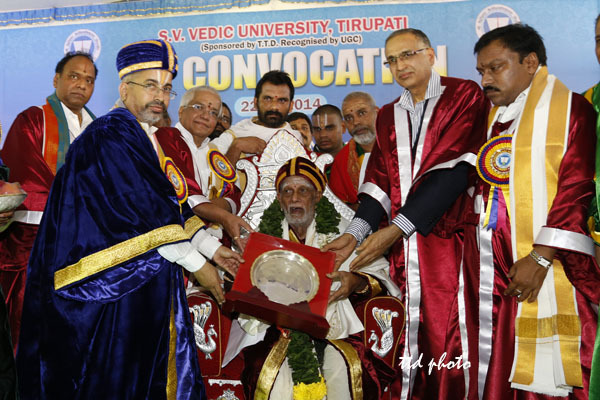 “This year from October 10-14 we will be conducting a Veda Sadas in Tirumala where eminent scholars will be invited to present their papers”, he added.